"Thank you so much for all of your help, I was extremely nervous before starting the course but you helped me gain the knowledge and skills needed to succeed. " The Mini Blue Driving School logo is a trademark. All other trademarks and logos used in this website are the trademarks or logos of their respective owners. This website contains links to other websites that are operated by third parties. mini blue driving school does not accept any liability over the content of these third party sites. The existence of these links do not constitute an endorsement of such websites, and your linking to these sites is at your own risk. 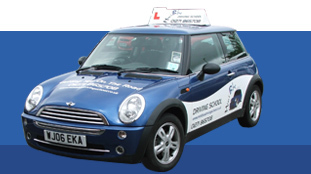 Mini Blue driving school do not guarantee that access to this website will be uninterrupted, that this website will be free from viruses or that this website cannot be tampered with by third parties. This website and the information are provided on an 'as is' basis, with no warranties of any kind whatsoever, either express or implied, including, but not limited to, any warranties or any implied warranties of merchantability or fitness for a particular purpose. Use of this website and the information is entirely at the user's sole risk. In no event will Mini Blue driving school be liable for any damages whatsoever arising out of or related to this website. Your sole and exlcusive remedy for dissatisfaction with this website and/or information is to stop using the site and the information. Mini Blue driving school may modify the terms of this agreement on this site. You agree to periodically review this agreement to be aware of any such revisions. Should the revision be unacceptable to you, you agree to stop accessing this site. Your continued use of this website following such notification of any such revision(s) shall be deemed as acceptance of and agreement to abide by all such revisions. on your site visit. Cancellations: Unless 24hrs notice is given lessons must be paid for. Road Safety: The instructor has the right to withdraw the car from the test without notice should a pupil not be up to test standard. There is no guarantee that a pupil will reach test standard or pass the test.